Car camping for hikers makes sense when you want to maximize your trail time, cut down on transportation costs, and tap out an interesting hiking area over several days. Driving to and from a trail head takes time, so if you camp nearby, you can arrive there early to beat the heat - or get a jump on hordes of other hikers. Car camping for hikers also makes sense on a vacation which targets several hiking areas within a short period of time. Car camping eliminates the hassle of wasting time on the road, yet gives you flexibility. And it provides some of the comforts of home, if you plan things right. These tips will streamline the process of car camping for hikers who want to get away from it all, using an established campground as base camp. Your decision to use car camping as a base camp approach to day hiking is a smart one. But it won't feel so smart if you leave something critical behind, like the stove or water containers. Use my modular approach to car camping adventures as a guide to getting yourself ready to meld two universes: camping, and hiking. You want all the comforts of home - without having to hire an extra van to haul your stuff. So you'll have to do comfort, along with safety, in a minimalist fashion. These planning tips for smart car camping will also minimize your chore list and leave you plenty of time for knocking off those day hikes on your bucket list. your food storage and preparation. You know those deep plastic containers with lids? Then fill it with all of the things you will be reaching for when it's time to put a meal on the picnic table at your campsite. When you get home, clean up everything and store it, ready to go on a moment's notice, next time the car camping for hikers urge strikes. You will open and close this box innumerable times, so choose your lid wisely. A lid which clicks tight with just a little pressure is going to save you some headaches, such as chipmunk raids on the potato chips, or spilled sticky stuff in the car. Here's the 24 gallon Rubbermaid type I use, and I must say it has held up well for nearly double digit years of use. Plus, it slides nicely into the back of the car, or into the gear locker during the off season. I just did an inventory of mine, so I wouldn't forget anything on this list of recommended camp kitchen items. Now, let's look at car camping for hikers safe food storage options. Your destination determines your food storage options. If you're in a campground which provides animal proof storage containers or lockers, please use them! A fed animal? A dead animal. Or an aggressive, aggravating nuisance. Of course, your car can become your food storage unit. But if you need your car to travel a few miles to a trail head, and your food is left behind so it doesn't fry inside a locked car in direct sunlight, you'll have to think through how to keep it out of the clutches mouths of the neighbors. If rodents are your most formidable enemy, a second storage container like your kitchen box will keep your non-perishable food locked down tight. The worst that could happen? Mouse poop on the top, signifying the disdain of the locals. If bears are known to inhabit the area and you need your own storage method (these are not usually provided at primitive campgrounds), a bear canister is less hassle than hanging your food from a tree. Your perishable items will need a cooler containing a block or bags of ice. And only you can determine which size you need, anywhere from 30 quarts to over 60 quarts of capacity. Gotta love the quaint "quarts", right? Seems that we're stuck with it in the U.S., although backpacks use "liters" for capacity. Go figure. With coolers, you can go a little crazy, or stick to your minimalist principles. You can also choose soft sided, or hard sided coolers. Downsides of a hard sided cooler? They take up the same amount of space empty or full, although one could argue that storage space for dirty clothes and muddy gear on the way home could be useful. As with your kitchen box, choose the lid wisely. A tightly fitted lid that locks down will keep your ice from melting quickly. A lid that's a snap to get open and shut will save your coolness inside the cooler. No surprise that a cooler with a well designed, tight lid will cost more than the cheapo Styrofoam tub at the dollar store. Think of buying a good cooler as a long term investment in your car camping success! If you know that car camping for hikers is the path for you, now and well into the future, invest in a cooler that will hang in there with you over the years to come without fail. You have to pay for what you get, and you might balk at the price tag on a YETI. Again, as with all well made, durable gear pitched at car camping for hikers, remind yourself that you're in this camping thing for the long haul. You can also press this cooler into service during a power outage or natural disaster, to keep food and medicine from spoiling until electricity becomes available again. I'm a huge fan of Coleman, and my camping gear from them has lasted for years and years. The Coleman stoves are easy to set up, easy to use, and pack down small enough to perch atop the food cooler in the car. Staying with our modular approach, take a look at this 5 gallon (20L) "water cube". These water containers have the benefit of a small footprint for storage at home and during transport, while expanding to show you exactly the volume you're after. Opaque, hard sided water containers won't do that for you. The thing that always catches me by surprise is how luxurious life at home is: flip a switch for instant light. So another thing that you should pack in your tote bag: illumination options. If you've got a headlamp, be sure you have enough juice in the batteries to last for all of the trips to and from the car, to and from the bathroom, etc. Having your illumination on your head makes for easy hands free dexterity. Just be sure to realize that wherever you look, you're blinding any oncoming traffic! A flashlight can be useful not only while camping, but at home, too. Nightfall is a magical event in car camping for hikers. And there's something so cozy about a lantern sitting on a stump or picnic table when darkness falls. I love my vintage Coleman lantern! This newer (but still solid Coleman design) version can use 2 types of fuel, giving you some flexibility when on the road. It doesn't use fuel bottles that have to be disposed of properly. No more guess work about whether/not there's enough fuel in any one bottle for a trip (one of my pet peeves). It throws plenty of light for at least a 10 foot radius, making it possible to do close work. You can put it on a pole for a softer, wider circle of light, thanks to its wire handle. Your days will be spent hiking, which means you'll come back to home, sweet home with achy legs and a tired back. Pull up a soft rock and take your boots off! I love how the side stash pocket can hold my journal, Kindle, plus my headlamp, while I sip a cup of tea as I enjoy the luxury of a padded seat. Or during breakfast, I can place my camp mug in one cup holder, my phone in the other, while I dig into my oatmeal. But here's the best part: this chair folds up small and slides into its cylindrical carrying case, so you don't have to devote a lot of room to it in the car. No reason it can't come along on your camping trip! Read about good backpacking chair choices here. With a campsite as your base of operations, you can have a more luxurious tent than you would haul along on a backpacking trip. The bad news: you will pay for the luxury of more head and leg room, larger doors for easy access, more protection from rain. The double doors make it easy for one person to slip out for a midnight trip to the bathroom without disturbing the other camper. The rain fly (not shown) provides a vestibule, so taking off dirty, soggy footwear is not the chore it would be inside the tent. Or you can invest in a larger tent, if your camping party exceeds two minimalist people or includes a rambunctious dog or three. The full coverage fly (not shown here) makes it a given that you'll keep water out of your living space, yet have adequate ventilation options. It even has a headlamp pocket that allows you to light up the tent's interior as you get ready for bed. Something very amazing happens when I sit in front of a crackly campfire after a long day on the trail. And it's a privilege I don't get to have while backpacking, so I savor my campfire moments. plan to make a fire at your campsite. To make it easy to get one started, as well as to put it out safely, you'll need to tote along some supplies (so perhaps 2 rugged tote bags are in order). Load up on fire starters like paper, wood chips, or dry tinder like pine cones or grass. A lighter is much more reliable than matches in windy weather, and has the advantage of not getting soggy in wet weather. Keep it in a small pouch in your fire starter tote, or risk losing it completely (which can put the kibosh on a fun camping trip, or make it a necessity to meet the folks at the next campsite). Use this SOL Fire Lite kit when you're too tired to fuss with shaving wood chips with a pocket knife, or too hungry to search for tinder to coax a fire into being. Dedicate a bucket or other water receptacle to sit by the fire, in case a gust of wind or popping sparks causes your fire to get too big or to spread outside the designated fire ring. This collapsible Ultimate Survival Technologies FlexWare bucket (10L) can double as a kitchen sink, a hair and hand washing station, a hamper inside the tent for dirty clothing, or a berry picking bucket (should you wander into enough ripe huckleberries to fill it up). So what good would a car camping for hikers list be, without some fun stuff? Here are a few of the things I pack just because I love to use them while I'm camping. They make the campsite feel like home! Create the illusion of fairyland with these mini SiteLights. Or light the exterior of the tent so no one trips over the stakes, or highlight the pathway between tent and picnic table, with these dimmable lights on ten feet of cord. Available in a longer length, too! When I want soft light without worrying about batteries, I bring along this BioLite SunLight solar light. It's inexpensive and very small (ice cream sandwich size), but the 100 lumens are perfect for reading, gear repairs, or other close work. Leave it in the sun to charge while you're off on your day hike, and know that you'll have up to 50 hours of illumination. If you're really serious about solar power at your campsite, invest in this BioLite BLXL Solar Kit, complete with a solar panel, lantern and USB power storage. It solves one of the most vexing problems of car camping for hikers: keeping your devices powered up during a long trip. This REI Co-op tarp can be pitched over your picnic table and kitchen set up, to keep the raindrops from running down your neck while you're brewing your morning coffee. If you purchase the optional adjustable tarp pole, you'll keep your line of sight clear, too. We forget how comfortable our daily lives are, with carpeted floors, padded seat cushions, and soft beds. This REI CO-op sit pad can be pressed into service when you've gone to the river bank for some serenity. With a bit of caution to avoid rocks or sparks, you can kneel on it when you're building and enjoying the campfire. I was recently gifted with this Therm-a-Rest NeoAir XLite sleeping pad, and there's no way I'm ever going camping (or backpacking) without it! Hopefully you'll never have to utter that sentence at a campsite, if you've used these tips for car camping. But maybe I've overlooked a tip or trick that you'd love to share here on this page! 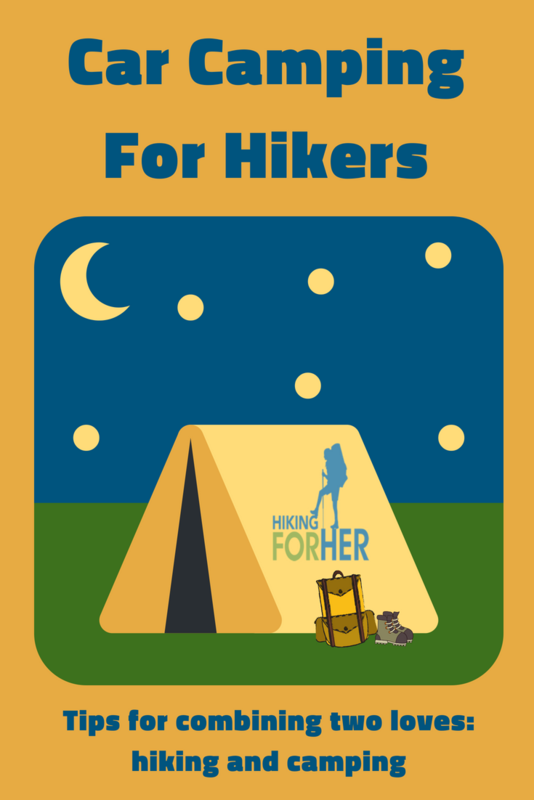 Contact me and let's make this car camping for hikers resource list as good as it can be! Or maybe you're ready to head out there and claim a campsite for your day hiking adventure! Don't go hungry, though. 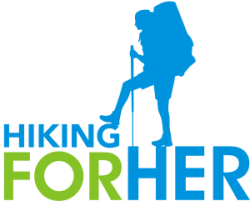 Some of the links on this page and elsewhere on the Hiking For Her website point to affiliates, meaning you get great product recommendations for your purchases. HFH will receive a small (single digit) percentage of your purchase price, but it costs you nothing extra to enjoy these great products from reputable companies.